November 10th is Community Day at Brio Fitness which means classes and gym time are free all day! Are you looking for a challenge? 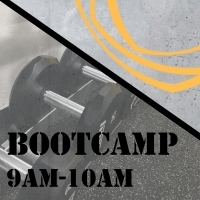 Are you looking to take you fitness to the next level? Join us for Bootcamp at Brio! This class happens every Saturday from 9am - 10am. You can push your limits, challenge your body and crush your goals. If you get hooked, talk to our membership coordinators about how you can come back for more!